Reviewed from e-copy received from author. Kristen Day is a southern belle at heart with a crazy streak that desperately tries to escape at every opportunity. She loves all things nostalgic, rustic, and quirky. She's been told she sees the world through rose-colored glasses, but she prefers to think of them as kaleidoscope glasses - swirling and morphing reality into something she can digest (who hasn't pretended those pasty lima beans were really kiwi strawberry jelly beans?). She is the author of the DAUGHTERS OF THE SEA trilogy, which includes FORSAKEN, AWAKEN (Oct 2012), and CHOSEN (Winter 2012). She loves all books, but really enjoys writing young adult, paranormal romances. She's loved to write for as long as she can remember. Her first published work was her poem RED in second grade (you guessed it - it was a poem about the color red - life altering, right?) that won her 5 gold stars and a spot in her elementary school's poetry book. That's when her addiction to the written word officially began. She was the only kid in fifth grade that actually enjoyed diagramming sentences. Go ahead and laugh - its okay. When she's not writing, she's making jewelry, painting, drinking sweet tea, watching the Discovery Channel, or going on random adventures in the mountains of North Carolina with her amazing husband. 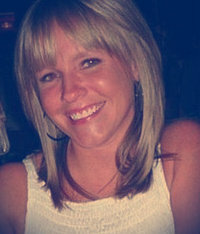 She was born in Boone, NC and graduated from Appalachian State University with a degree in Marketing in 2001. I loved this book! I wasn't sure going in, it sounded a little bit dark when I first read about it, but at the same time I was intrigued. I'm glad I gave it a try. Not only is it well-written, but the characters are interesting with some nice depth to them. Hannah/Anastasia is a great heroine as she tries to come to grips with her past and deal with the shocking revelations of the present. Her roommates at The House of Lorelei are great, I liked them immediately. I especially appreciated how similar and yet very different each of the girls is with their unique personalities and talents. Finn, whoa boy, makes for a great love interest, definitely hot, but very mysterious and Hannah isn't sure whether she can trust him or not despite their connection. I loved the setting. The author did such a great job with the setting of The House of Loreleit hat I pictured it very clearly in my mind. I immediately wanted to hop on an airplane and go visit, it was so vivid in detail. What a fascinating school as well, I enjoyed visiting through the author's words and I very much look forward to visiting again in the coming books. In terms of plot, all I can say is wow. This series is ideal for students who love mythology but are looking for some great romance with it. Hannah faces many challenges once she arrives at her new school. She is stunned when she is informed about the unique abilities of the students at this school. Not only that, she continues to struggle with questions about who she really is and where she came from and what happened to her parents. Through in Finn, whose been appearing in her dreams for years, and the feelings he arouses in her as well as her studies and Hannah's got her work cut out for her. But she's got some great friends in her corner. There is a little bit of language and a moderate amount of violence. I do highly recommend this book and very much look forward to reading the coming sequels. Hi Heidi! Thank you so much for your review!! I'm so happy you 'Loved it'! "In terms of plot, all i can say is wow." - what a compliment!! It means so much to have a book blogger like yourself say that. Thanks again and stay tuned - Awaken comes out next Tuesday!